Penn (10-4): Don’t be surprised if Penn projects itself into the Ivy race this season. And if they do, it will be most assuredly on the back of last year’s RTC Ivy POY Zack Rosen. The 6’1 junior was at or near the top in five key stats, including leading the league in scoring. If he continues to mature as a player, he very well could receive a lot of national recognition, a la Jeremy Lin and Ryan Wittman last season. Now, if only the rest of the roster can remain healthy — a difficult task the past two years — the Quakers can take aim at what they consider their rightful place at the top of the league. Cornell (9-5): How the mighty have fallen; Is the reign of the Big Red over? Maybe not, despite huge losses via graduation. They return four players who saw considerable action during last year’s championship run (Chris Wroblewski, Errick Peck, Adam Wire, and Mark Coury), and thus have enjoyed and expect success. While this year’s freshman class was recruited by Steve Donahue, who is no longer with the program, they come with promising credentials. Should our projections hold true, the future in Ithaca should be bright. Remember, it was new leader Bill Courtney who recruited most of the George Mason NCAA Final Four team in 2006. Brown (5-9): The bad news: the graduation of All-Ivy Matt Mullery, who led the Bears last season in several offensive stats. The good news: the next six scorers all return, led by Peter Sullivan and All-Ivy freshman Tucker Halperin. Brown could improve by leaps and bounds; They went 4-4 over their final eight league games, which included an almost unheard of weekend road sweep of Penn and Princeton. We would not be surprised to see the Bears make a run. Columbia (4-10): One would have to consider the now-concluded Joe Jones era a disappointment. At times showing promise during his seven-year tenure (one top four finish), the bottom line is that the Lions were 20 games below .500 in Ivy play during that period. 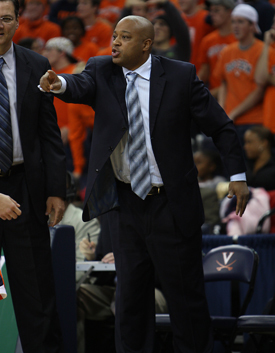 Enter Kyle Smith, the former associate head coach at St. Mary’s of California. He was responsible for running the offense and coordinating all recruiting activities. And lest you forget, St. Mary’s reached the Sweet 16 in last year’s tournament. Admittedly, it is not easy to build a program and win at Columbia — one has to go back to the Jim Macmillan/Heyward Dotson days. Maybe Smith, a master recruiter, is exactly what the Lions need. Yale (3-11): There is still one Jones left in the Ivy League: James at Yale. And to offset the loss of All-Ivy swingman Alex Zampier, Jones brought in a national recruiting class, with players from California, Connecticut, Iowa, Massachusetts and New York, all of whom were 1000-point scorers in their high school careers. Additionally, the Elis return six players who averaged more than ten minutes of playing time per game, led by second-leading scorer Michael Sands. If the class of 2014 can contribute immediately, Yale could be one of the deepest teams in the league. Dartmouth (2-12): Hope in Hanover? Paul Cormier, who returns for his second tour of duty at Dartmouth, must think there’s some. The basis for such optimism lies in the fact that the Big Green, who amazingly had no player average in double figures last year, returns five of their top six scorers and eight players who averaged double figures in minutes played. This group is led by 6’1 Ronnie Dixon, the best shooter on the team. If the rest of the returnees can show some improvement, perhaps Cormier can lead his team out of the cellar. Last season, the Ivy League sent three teams — Princeton, Harvard, and Cornell — into postseason play. The success Cornell had in the NCAA Tournament did not come as a surprise to RTC after a near-upset of Kansas in Allen Fieldhouse. This led many teams in the league to put together an aggressive nonconference schedule. This could turn into a double-edged sword; if the top teams can’t knock off tough nonconference opponents and later on beat each other up while the lesser teams of the Ivy improve, we could see a league champion with an overall record in the neighborhood of .500. But that’s looking at the glass half-empty. How long will it take new Big Red coach Bill Courtney to return Cornell to the NCAA Tournament? They lost their core of Ryan Wittman, Jeff Foote and Louis Dale, making the decision of former coach Steve Donahue to leave the program a considerably easy one. This entry was posted on Monday, August 9th, 2010 at 5:54 am by Brian Goodman	and is filed under summer school. Tagged: bill courtney, brown, columbia, cornell, dartmouth, harvard, jeremy lin, penn, princeton, ryan wittman, steve donahue, yale, zack rosen. You can follow any responses to this entry through the RSS 2.0 feed. You can leave a response, or trackback from your own site.